The apartments are located in the 5-star tourist complex Goldcity. 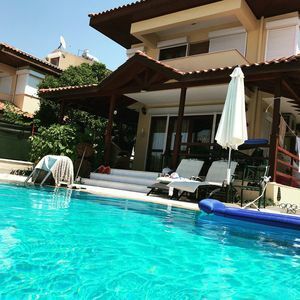 The hotel has all kinds of amenities: indoor and outdoor swimming pools, restaurants, bars, bowling alleys, gardens, cinema, aqua park, gym, spa with free sauna, Turkish bath and swimming pool, beauty salon, lake with water skis, private beach. The apartment has 2 bedrooms, 2 bathrooms, 1 laundry room and a large American living room with kitchen and balcony. 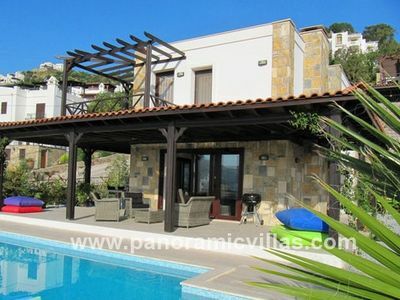 The windows offer panoramic views of the mountains and the sea. The apartment is located on the 9th floor in the main complex of 5-star hotel Goldcity Tourism Complex. 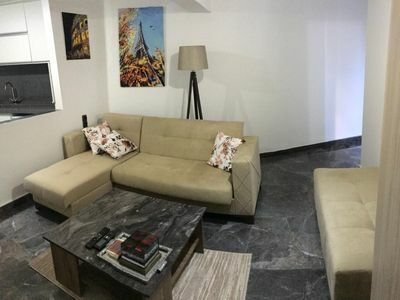 The apartment has two rooms with modern renovation, fully furnished. Two Bathrooms, one of them in the bedroom (ensuite). Hall and dining room with panoramic windows and balcony, views of the mountains and the sea. The kitchen is equipped with all modern appliances and utensils. The apartment also has a separate laundry room, with a washing machine and iron. The apartment is bright, cozy, with beautiful views. Descending down the elevator you can immediately get to a large spa complex, with an indoor pool, hammam, saunas, relaxation area and relaxation. (Included in the price). Also in the spa complex there is a hairdresser, massage rooms, beauty salon. 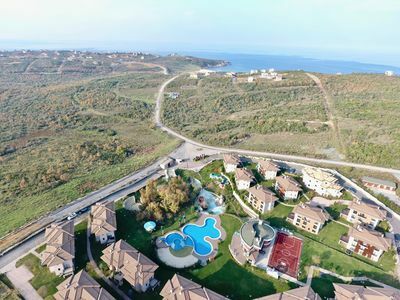 On the territory of the complex there is a gym, a cinema, several restaurants, a mini market, water slides (water park), a theater, a lake with water skis, several outdoor pools, billiards, bowling, several cafes (including 24-hour). 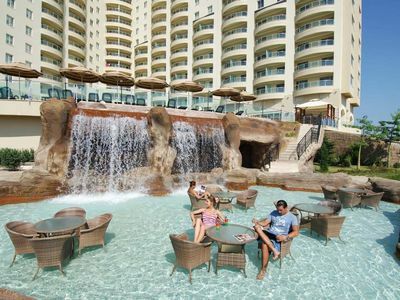 On the complex's own private beach there are all kinds of water and sports entertainment. Excellent for both families and business people. Accommodation is possible for a long time. The tourist complex offers 7 restaurants, serving Turkish, Italian, Mexican and Mediterranean cuisine. Each restaurant offers special menus and live music. Cocktails and refreshing drinks can be ordered in 6 different bars. The hotel has a 24-hour front desk. Laundry and cleaning services are provided on request (not included). The hotel offers free parking and 24-hour security. For relaxation, guests can soak up the sun in a sun lounger by the pool or take part in organized sports events and recreational activities. The award-winning Goldcity resort covers an area of 3,500 m² and offers several treatments, a hammam, a sauna and a gym. The hotel has: an indoor swimming pool, outdoor swimming pools, a water park with large slides, a lake with water skis, bars, an Irish pub, four restaurants, a market, a cinema, bowling, hamam, saunas, beauty salon, massage rooms, recreation areas, gardens, children. area. Our interaction with you will be the same or minimal as you want, but you will always have easy access to support if you have any questions or needs. I strive to make your vacation wonderful. You can always contact me if something unexpected happens or if any needs are not met. You can always contact me by sending me a message. I will answer it as soon as I read it. I always try to make your holiday wonderful. Always glad to see you in Turkey. I will be glad to work for you! Mahmutlar is a city in the Alanya area of the Antalya region. 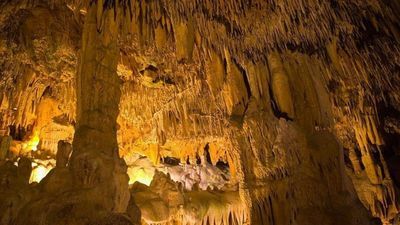 It is located 130 kilometers from Antalya and 8 kilometers from Alanya. The city of Mahmutlar, which occupies the territory of the Mediterranean coast at 4.5 kilometers, became a municipality in 1974. It is the first city municipality of Alanya. In the north it is surrounded by the Taurus Mountains, and in the south by the Mediterranean Sea. In the eastern direction is the tourist city of Kargikak, and on the west - the tourist town of Kestel. The climate of the region is Mediterranean, characterized by hot dry summers and warm rainy winters. The average annual air temperature is 18.6 C. In the area, with the exception of agricultural land, the Mediterranean type of vegetation dominates. The population of Mahmutlar varies according to the winter and summer seasons. In the summer, its number reaches 50-60 thousand people, whereas in winter it is about 15 thousand. The city is home to more than 5,000 Dutch, Russian, Irish and German families. The most important source of income for the city is tourism. There are seven 4-star hotels, thirteen 3-star hotels and as many as forty-nine tourist institutions with several thousand hotel rooms. Businesses, serving tourism, receive high economic income. The city is actively being built and developing. The authorities are taking active steps to develop its infrastructure, knowing full well that one natural and climatic potential is not enough for the development of tourism. 3 kilometers from the city center there are carefully preserved forests. Here began the construction of a recreational area, which will include picnic areas, seats, walking routes, panoramic terraces and a buffet. For the development of winter tourism on the territory of 33 thousand square meters will be built sports complex. In the vicinity of the resort are the ruins of two ancient cities - Leartres and Naula. Leartres, according to legend, was founded by Claudius. It perfectly preserved the Basilica, the Temple of Apollo, the Odeon, the Imperial Street and the Tower of the Observatory. The main building material was limestone and partly marble. The metropolis of the city is in the south, and the acropolis is in the southeast. Another city - Nahula, existed in Byzantine times. Mahmutlar became a municipality in 1974. This is the first city municipality of Alanya. 3 km from the city center there is a protected forest area - Mahmutlar Belediyesi Mesire. The climate is subtropical Mediterranean. This area is unique in the climate, many sunny days a year, thanks to which the abundance of fruits and vegetables does not stop. The minimum temperature in winter at night is +12 degrees, seismic activity in the region is zero. In the city there are 4 primary schools, 1 secondary school, there are extended groups after school, in 3 training centers, a private kindergarten. In the center of Mahmutlar there are shopping complexes and shops, restaurants and discotheques, health and beauty salons. 2 times a week there is a bazaar in the city. In the city there are bars, shops, restaurants and supermarkets Bim, Genpa, Shok, A-101, Migros. In Mahmutlar there are 3 main streets, this is Ataturk Street, Barbaross Street and the central coastal street - Antalya-Mersin Highway. Every 15 minutes, public transport passes through these streets. There are also many central streets that vertically intersect with these main streets. Among all the streets the busiest street is Barbaross, as there are various offices, banks, municipality, elite buildings along this street. 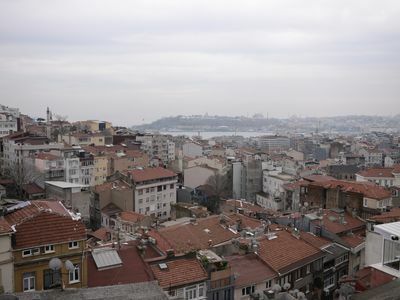 The city is located along the sea, along the sea the road is laid and this roadway is called the first line. The second street running along the sea, is 150-250 meters from the sea, and runs parallel to the road, paved with cobblestones - Prospect Barbaross. Ataturk Avenue is located 300-500 meters from the sea. Private VIP transfer service: Private minibus (Mercedes / VW up to 8 people) price for the car, for All. 30 Euro Gazipasa airport / 60 Euro Antalya airport . Date of arrival, arrival Time, from what city, flight Number, name for the plate to meet, the number of passengers, the need for a child seat. I'm waiting to hear from you. Thanks. 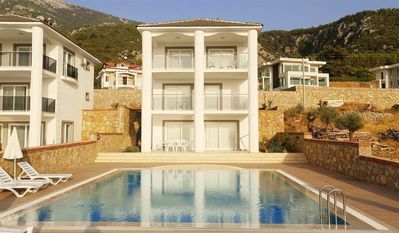 LUCKSHERRY A WIDE SELECTION OF HOLIDAY VACATION RENTALS APARTMENTS AND VILLAS ON THE MEDITERRANEAN COAST FOR RENT AND SALE. MEETING AT THE AIRPORT. Russian: Citizen of Turkey and Russia. 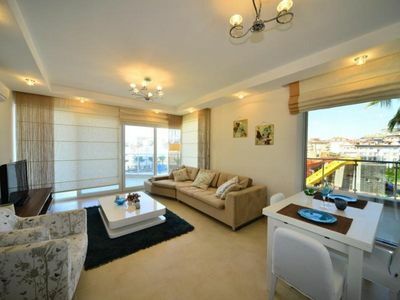 Rent your property in Turkey, as well as the property of their friends and acquaintances. 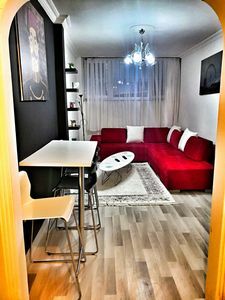 Constantly live in Turkey, will make your stay comfortable and without worries. I work in accordance with the laws of Turkey. Registration of guests in the police and payment of taxes. 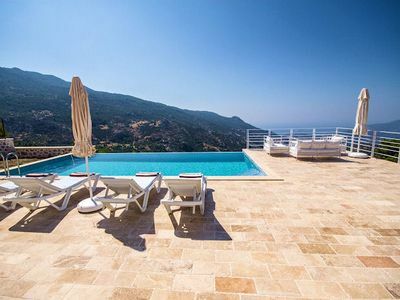 Deal with Rental/Sale Lucksherry property in Turkey. Positive, with an active life position. I am fond of the history of the Ancient world, Greece, the Roman Empire, Byzantium. I will organize you a fascinating trip to the places of the Ancient Roman Empire in Turkey. I invite all of you to visit! 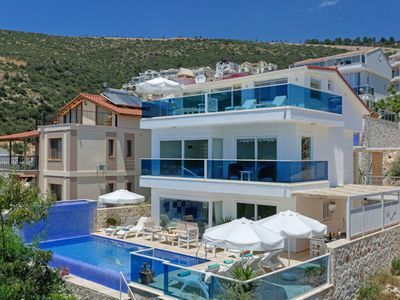 A WIDE SELECTION OF LUXURY APARTMENTS VILLAS AND PENTHOUSES ON THE MEDITERRANEAN COAST FOR RENT AND SALE, THE ORGANIZATION OF TRANSFERS AND EXCURSIONS. MEETING AT THE AIRPORT. CONSULTATIONS ON ANY ISSUES. 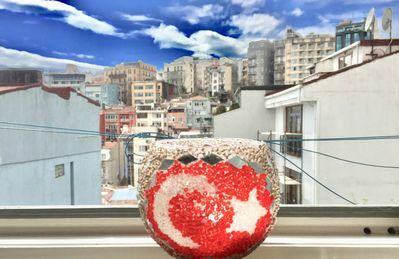 Turkey is a fabulous country. Alanya is the warmest place. Here the sun and the sea, environmentally friendly, sun-soaked products, kindly responsive people. You're welcome! Real estate broker-does not take %from the client. He just shares with you the additional profit, which creates its participation in the transaction through its own license company.